This isthethird installmentin a series of video blog posts (introduced here) sharing the story and culture of Logos Bible Software. Other posts in the seriesare archived in the Video category. Hear about the move from New Jersey to Washington,developer meetings at Denny’s restaurant, and see photos of the first Logos offices. Note: All videos are in Windows Media format. Mac users may need to download the free Flip4Mac plugin for playback within QuickTime. Daniel Foster | Mon, January 22, 2007 | Misc. Logos Bible Software 3 has been selected as one of threestatewide finalists for Consumer Product of the Year, alongside Farecast.com—one of the hottest new travel websites of 2006—and WhitePages.com Mobile. In the state that is home to Microsoft, RealNetworks and a host of other innovative tech companies, it’s a real honor to be recognized in this way. We’ll find out whether we won top honors March 21 at the WSA Industry Achievement Award event in Seattle. The theme this year is Heroes of Innovation, hence the cool superhero graphics. This annual industry award is sponsored by WSA, the largest technology trade association in Washington State. I’m super excited that Logos is a finalist for this award. Not only for the recognition of Logos Bible Software 3 as an innovative and technically excellent product, but also because at the awards ceremony 1,000 leaders from the technology industry in Washington State will hear about Logos Bible Software. Microsoft is a major sponsor of the event, along with the region’s widely-read business publication,Puget Sound Business Journal. The keynote speaker for the event will be Robbie Bach, President, Entertainment and Devices Division, Microsoft Corporation. The successful applicant will demonstrate technical innovation, consumer adoption, intuitiveness, value to consumers, staying power and general distinction of the applicant’s product in the consumer marketplace. Past winners in this category include household names such as WhitePages.com, Expedia, and RealPlayer. This is great recognition for Logos—both the company and the product! The WSA press release and site don’t provide links to the companies and products that are nominated for the various industry achievement awards, but I was curious about who else made it and googled them to find out. The wide range of technologies and applicationsnominated providesa glimpse into the innovation going on in Washington State. It also drives home to me the value of having a product name that describes the product! Chris Diorio, Ph.D., Chairman and CTO, Impinj, Inc.
Daniel Foster | Fri, January 19, 2007 | Misc. Today’s guest blogger is Dan Pritchett, director of marketing for Logos. We just realized that it has been nearly ten years that we have been partnering with an amazing man who has personally helped thousands of you get the most out ofyour Logos Bible Software. Who is this amazing man you ask? “I became a disciple of Jesus Christ and teacher of His Word through the personal ministry of my good friend and best selling author Robert Morgan. In the early 80’s Rob began instilling in me a love for the Bible and Christian books as well as a desire to study and teach Scripture effectively. I, therefore, dutifully set out to build my personal library of print books. I spent years and thousands of dollars securing many needed resources. As I developed into a pastor – teacher I spent countless hours in study and sermon preparation. When the personal computer age hit I was reluctant to enter the electronic world choosing rather to stay in my comfort zone of pen and paper. In the late 90’s a friend bought me a copy of Logos Bible Software. Not owning or knowing how to use a computer the software remained in the box. Finally, another friend loaned me a computer, loaded the software, and instructed me to become proficient with both the software and a computer “for my own good”. After a week of reading the Logos Bible Software Users Guide and “hunting and pecking” around the keyboard I actually started studying the Bible electronically. I was shocked to discover the profound impact this new method of study had on my biblical research and sermon preparation. The world of Logos Bible Software allowed me to study and prepare sermons both more quickly and effectively. I introduced my friends to the software and began teaching them how to use it. I then began putting my software teaching outlines into manual form to develop the first Quick Reference Training Manual. Through the encouragement of friends I contacted the leadership at Logos Research Systems informing them of my instructional classes for their software and desire to partner with them to train their users. They invited me to their Oak Harbor, WA headquarters in 1998 to conduct the national Camp Logos. After the seminar I shared my vision to take this training around the country from church to church equipping people to effectively use Logos Bible Software. The Logos leadership enthusiastically agreed. In the fall of 1998 the regional Camp Logos hit the road. We named this new training endeavor Morris Proctor Seminars. For nearly ten years my wife, Cindy, and I, along with some faithful assistants, have conducted hundreds of hands on training seminars around the country and now even around the world as the Logos family spreads internationally. In addition to the live training seminars we produce videos on CD and DVD, print manuals, and miscellaneous training materials all designed to help Logos users get the most out of their software In 2001. You can get to know Morris better and experience his personal and patient training style best by attending one of his “Camp Logos” events, or by purchasing one of his excellent training CDs or manuals. We couldn’t be more pleased with Morris. He has been a fantastic partner and friend of ours for manyyears. As you read in his story, he started out as a pastor who did not even own a computer. He ended up becoming a trainer and one of the most proficient users of Logos Bible Softwareever because a friend bought a copy of Logos for him. Once Morris finally gave it a try he fell in love with the software for its ability to take him deeper into God’s Word. Logos Bible Software doesn’t change lives – the Holy Word of God changes lives. Logos Bible Software just helps people get into the Word. Do you want to see those around you get deeper into God’s Word? Are you blessed to be in the position of being able to bless your pastors, missionaries, or friendswith the same gift that Morris received? If so,we want to help make it more affordable and thank you for passing on the blessing to others with a small token of ourappreciation. If you call 800-875-6467 and order theBible Study Library, Leader’s Library, or Scholar’s Libraryto bless someone else, we will give you 25% off the retail price anda$50.00 book unlock credit for yourself. If you order Scholar’s Library Silver, or Scholar’s Library Gold to bless someone else, we will give you 25% off the retail price and a $100.00 book unlock credit for yourself. If you don’t need the book unlock credit but just want to bless someone right away, use the coupon code BLESSING at checkouton Logos.comto get 25% off Bible Study Library, Leader’s Library,Scholar’s Library, Scholar’s Library Silver, or Scholar’s Library Gold. Bob Pritchett | Thu, January 18, 2007 | Misc. Today I filled out a survey for a company we buy software from. One question wanted me to rate their phone technical support on a scale of 1 to 9. But I have never phoned them. There was no “Don’t Know” option, and the survey software wouldn’t let me leave it blank. I gave phone support a six. The episode reminded me why I hate to take surveys. None-the-less, if you are a Logos Bible Software user, I am asking you to take a few minutes and fill one out for me. Because surveys really do help us design our software and prioritize projects. We read every response, and refer back to the aggregated results for months afterwards. Many of our existing features, policies, and product offerings were created in response to user feedback through earlier surveys. So please take a few minutes to answer this nine question survey (especially the annoying, but very helpful to us, question number five) and help us do an even better job of meeting your needs in future releases of Logos Bible Software. This isthe second installmentin a series of video blog posts (introduced here), sharing the story and culture of Logos Bible Software. In these four videoclips, you’ll hear Bob Pritchett talk about the initial goals of Logos, how early customer response helped enlarge the vision for what Bible software could do for people’s Bible study, and how the whole Pritchett family got involved in the enterprise. Daniel Foster | Mon, January 15, 2007 | Misc. I realize I’m inviting criticism by offering another way to increase the amount of email you receive from Logos so close on the heels of my Sipping from a Firehose post…but here goes. We recently added a way for you, the Logos Blog reader, to sign up to receive new blog posts directly to your email inbox. Some will argue that this defeats the whole purpose of RSS feeds and they’re right. I also know that plenty of people enjoy reading the Logos Blog yet have no interest in learning how RSS feeds work even if it’s super simple. They mastered email a long time ago and it works just fine, thank you very much. Every culture tells stories about itself. Stories that give answers to the Big Questions: where did we come from, who are we, where are we going? Stories that inspire and motivate; stories that enslave and perpetuate harmful attitudes. Some would say that without shared stories there’s really no “we” to talk about. Companies like Logos also tell culture-creating stories that define who we are and help delineate our collective purpose. But any period of rapid growth brings the attendant risk that the company’s culture will be lost, or at least lost on the new hires. This risk is especially acute when the new hires will be working thousands of miles away from the home office. Since we won’t be flying the new Field Sales team to Bellingham for every chili cookoff or field trip to the Dead Sea Scrolls—and it will be a little harder for Bob to take the new reps out for coffee—we’re recording stories from various Logos team members to share with the new hires. My guess is that some of these stories will be new for many of us who work right here in Bellingham, too. We’d also like to share some of these stories with you, so I’ll be posting a series of video interviews over the coming weeks that help tell the Logos story. The interviewer is Scott Lindsey, director of ministry relations, and Dale Pritchett is behind the camera. New sales jobs in eight cities! Bob Pritchett | Thu, January 11, 2007 | Misc. I wish that we could show Logos Bible Software to every Bible student in the world. Because when people who are serious about getting into the Word see how Logos Bible Software enhances their study, they can’t wait to use it. We try to show Logos in as many ways as we can. We put demo videos on the web, we present at conferences, and we even show it to seat-mates on airplanes. About the only thing we don’t do is go door-to-door. But we’re ready to try that, too. We are going to launch a national sales force of Field Representatives: full-time Logos employees who visit pastors and Bible students in eight large cities around the country, showing people how Logos Bible Software helps them do better, deeper Bible study while wasting less time finding things and flipping paper pages. Are you a salesperson looking for a product you can sell without reservation? Please take a look at the job description, and please feel free to forward it to anyone you know who might be interested. Our first openings will be in Atlanta, Chicago, Dallas/Ft. Worth, Houston, Los Angeles, Phoenix, Seattle, and Washington, DC. Daniel Foster | Wed, January 10, 2007 | Misc. I love being a dad and one of my favorite moments every day is when I get home after work and my daughters, aged 2 and 4, run to the door with hugs and squeals of delight. Makes a guy feel like a hero. It can also be a bit overwhelming, as the girls often try to outdo one another in relating the news of the day. There’s just so much to tell and all of it is highly important. As we attempt to convey all the stuff that’s happening at Logos I sometimes feel like my daughters. We have so much to communicate and everything is important, at least to some slice of our constituents. Though we do try to keep the squealing to a minimum. There’s certainly a risk ofinflicting information overload.But even with the blog, NewsWire, newsgroups, and alerts within Libronixwe often have to leave things unsaid. A classic example: with the massive influx of new prepublication titles it’s easyto lose track ofwhat’s been added to the prepublication page. That means eager customers who pre-order a title may wait longer for the title to gain enough support to move into production. Many of these titles would go straight into production if we could just deliver the message to allthe interested people (without swamping everyone else). The NewsWire email service will always remain the best way to stay current on the latest sales, specials, and new products from Logos. It’s for everyone and if you pay attention to nothing else from us, you should be sure to open NewsWire when it hits your inbox. But now you canreceive additional announcements in areas of special interest. The four newemail lists described below will ensure that you’re hearing about the titles that are most important to you. We also hope that opening up this new communication channel will prevent some of the more “niche” titles from getting lost in the shuffle, giving them an extra boost and moving them into production more directly. Greek Interest – News, product announcements, and updates for those who work with the Greek language. Hebrew Interest – Ditto, but for Hebrew. Other Ancient Languages Interest – Ditto, but for “other ancient languages” such as Aramaic, Latin, Syriac, Coptic, Ugaritic, Armenian, Georgian, Gothic, Ethiopic, Old Church Slavonic. Academic Interest – This list is not related to the academic purchase program. It’s for people who have a strong interest in scholarly books that tend to interact heavily with the literature of biblical studies.For example, theLibrary of NT Studies: JSNTS on Paulor Barth’s Church Dogmatics. We haven’t sent the first mailing to any of these lists yet, but you can sign up now and get in from the beginning. If you don’t find it to be useful, you can always unsubscribe later. Hint: Be sure to follow all the steps below, as these are double opt-in lists. Check the box next to each subscription you want to receive. Click the “Update Subscriptions” button at the bottom. Your computer will think for a few seconds as the server subscribes/unsubscribes you appropriately. Once you’ve confirmed your subscription(s), the My Subscriptions page will show a checkmark by each mailing you’ll receive. The list manager will send you another email letting you know you’re subscribed and confirmed. Daniel Foster | Tue, January 9, 2007 | Misc. 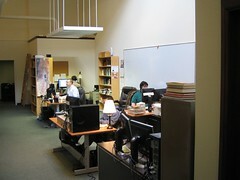 The last week of December saw another shuffle at our Bellingham offices. Hopefully it was all transparent to you, the customer, but about half of us moved our desks to a different location. The growing Design & Editorial department moved across the building, salespeople were all shuffled,and the entire support team moved from 1313 Commercial to a building two doors down the block (the space briefly occupied by Room2Think). Why all the moves and why should you care? One word: growth. 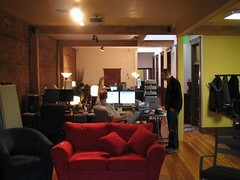 Recent hiring and planned expansion for 2007 put us at max capacity. To continue to expand our operation, take on new data projects, launch new sales and marketing programs…we had to open up new space to put people. If you’re a Logos customer, growth is good news.It means more new books, ground-breaking databases, innovative products, and continued excellence in service and support. 2006 was a record year and we look forward to what 2007 holds! Keep in mind…if you or someone you know is bright, talented, passionate about the Bible, and looking for work…be sure tokeep an eye on our jobs page. 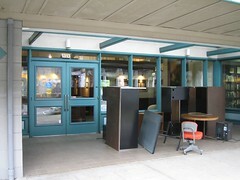 Logos is a great place to work and Bellingham is a great place to live! Get 2 Bonhoeffer Books for Just $0.99! Are Guardian Angels Really Biblical?